The option to pursue a business administration degree has been a steadily popular one among college applicants over the past decade. Part of this specialization’s appeal to the public lies precisely in its appearance of a degree one could land an important job with. 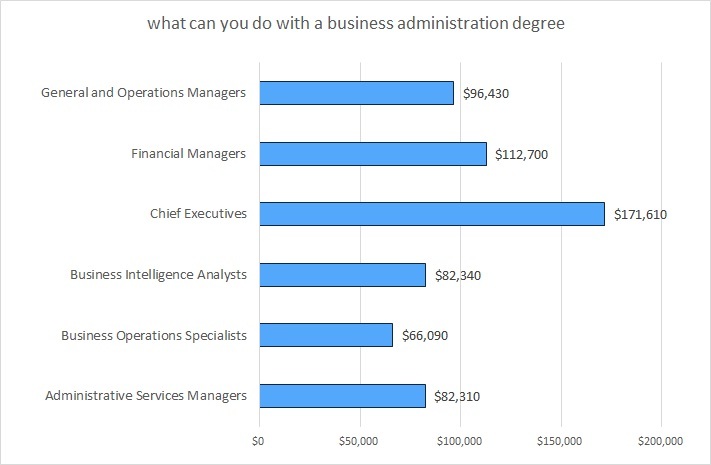 While this assumption isn’t necessarily wrong, the field being quite a valuable and needed one, many graduates find themselves wondering: what can you do with a business administration degree? For those of you wondering the same thing, don’t worry: there are plenty of goof bachelors in business administration jobs on the market, and the median salaries for this profession are also pretty impressive. Marketing Management: the median salary in this case is $123,450. As you can see, most of the fields in which you can find work with a business administration degree run salaries which are pretty impressive. Just so you know, a median salary isn’t the same thing with an average salary. The median means that half of all professionals working in that field earned a bit more than the median value (like the ones presented above), while the other half earned a bit less. How much more or how much less greatly depends on the employee’s experience, on the state where the employing company is, and other such factors. The bottom line through all the variables is that indeed, bachelors in business administration jobs tend to pay quite well, so thinking of following this career path is undoubtedly a good choice. After you manage to gain some experience (of around 5-7 years of working on an entry-level business administration position), you will be able to move on to a management position. As you can see from the table above, these also yield pretty impressive salaries as well. If you already have a business administration degree, or if you’re on your way of obtaining one, this is what you need to know about finding jobs for those of you with a bachelors in business administration. First of all, some sub-fields might make it easier for business administration graduates to find rewarding jobs in them, due to higher demand. We will detail the job growth rates for them directly below. Second of all, in a nutshell, what you need to know about this field is that the usual networking techniques useful for finding jobs in any given field can become perhaps even more important here. Traditional methods like job search engines can only do so much; and a better (albeit slower) way of landing a business administration position is by being promoted from within the company, or getting an interview via referrals (networking). Health Care Administration: an impressive 17% job outlook (growth) for business administrators in this sector.